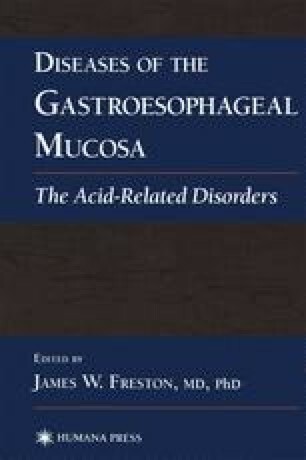 Gastroesophageal reflux disease (GERD) encompasses a spectrum of disorders in which gastric reflux leads to symptoms and/or damage to the esophageal mucosa. For the most part, it is a clinical diagnosis that may be objectively confirmed by a number of diagnostic tests. Presentations of GERD may vary widely, but can be divided into three categories: typical symptoms (heartburn and regurgitation), atypical symptoms (angina-like chest pain, asthma, cough, and laryngitis) and complications (ulcerations, strictures, and metaplastic changes or Barrett’s esophagus).